Info: Tsewang Norbu died after setting fire to himself and calling for freedom and the return of the Dalai Lama to Tibet. 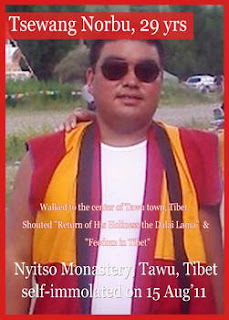 Tsewang Norbu drank petrol before immolating himself and died soon afterwards, according to Tibetan exiles in contact with the area. In a rare instance of prompt reporting on such an incident, the Chinese state media confirmed the death of a Buddhist monk shortly afterwards, with Xinhua stating: "it was unclear why he had burnt himself", and that the local government had launched an investigation. (Xinhua, August 15). A hotel receptionist near the scene of Tsewang Norbu’s death told AFP that the monk had been distributing leaflets, saying: "I saw a monk lying on the ground and burning, he died right in front of the county government building." (AFP, August 15). The state media confirmed that Tsewang Norbu had been swiftly cremated on Wednesday, August 17, evidence that the Kardze Party Secretary's instructions for a prompt cremation were followed. Xinhua reported that Nyitso monk Tsewang Norbu (Chinese transliteration: Tsongwon Norbu) had been "cremated Wednesday in accordance with Tibetan rituals", according to the local government. (Xinhua in English, August 17).